Moving parts typically reduce a smartphone's structural integrity and its durability, which is something that Zack Nelson on his JerryRigEverything YouTube channel regularly puts to the test. The Xiaomi Mi Mix 3, with its magnetic sliding mechanism, has now been subjected to Zack's scratch, burn and bend tests. The Oppo Find X first showed us that a motorised sliding mechanism could be a potential structural weak point on a smartphone. This did not stop Xiaomi from producing the Mi Mix 3, which incorporates a magnetic, mechanical sliding mechanism to maximise its screen to body ratio. The sliding mechanism not only looks more fun than the one in the Find X, but it has also proven to be more durable too. The Mi Mix 3 survived JRE's scratch test thanks to Xiaomi's use of Corning Gorilla glass, which scratches like most modern smartphones at level 6 on the Mohs scale of mineral hardness. Xiaomi has continued to equip its Mi Mix series with ceramic backs, which are much tougher to damage and only scratch at a level 8 on the same hardness scale. 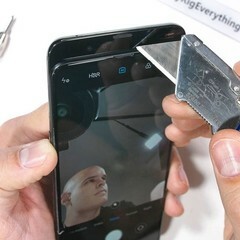 While Nelson praised Xiaomi for its use of ceramic on a comparatively cheap flagship smartphone, he also warned that the narrow gap between the sliding mechanism and the screen could trap sand or pocket lint over time and potentially damage or break the device. Additionally, the gap between the mechanism and the screen is one of the reasons why the Mi Mix 3 is not dustproof or water resistant. The device survived JRE's burn and bend tests though without any structural failures, although it did noticeably flex when Nelson tried to bend it. In short, the Mi Mix 3 is an exciting Chinese alternative to traditional flagship smartphones that has brought back the slider while retaining a modern design.